Custom-built double-decker showpiece is available for sale due to Owner s desire to retire. No expense was spared, and no detail was missed when creating this one-of-a-kind Nitrogen Ice Cream Truck. From the 3D custom color-changing vinyl wrap with reflective accents and LED lit plexi extensions, to the pink powder-coated benches on the rooftop, this is truly a work of art. 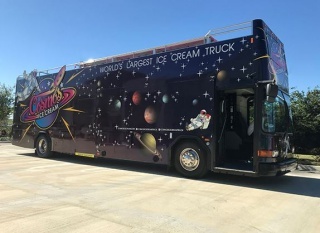 We are not just selling The World s Largest Ice Cream truck, but the brand and social media accounts with it. Email Steve@CosmosIceCream.com or call 954-415-9547 with questions.